1/4" Nozzle （Dia. x Height): Approx. 1.7cm x 3cm / 0.7" x 1.1"
1/2" Nozzle （Dia. x Height): Approx. 2.4cm x 4.5cm / 0.9" x 1.7"
3/4" Nozzle （Dia. x Height): Approx. 2.8cm x 5cm / 1.1" x 2"
1" Nozzle （Dia. x Height): Approx. 3.6cm x 8.5cm / 1.4" x 3.3"
3/2" Nozzle （Dia. x Height): Approx. 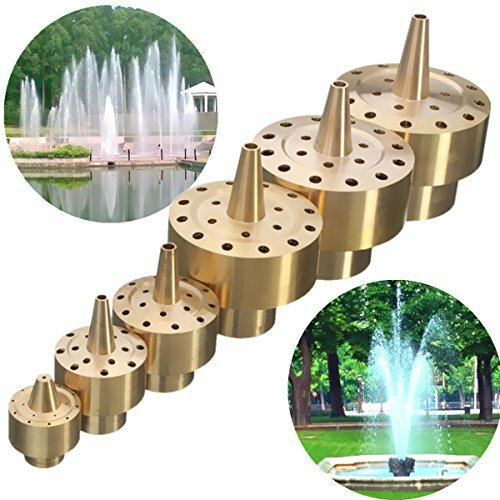 5cm x 8cm / 2" x 3.1"
2" Nozzle （Dia. x Height): Approx. 6.3cm x 9.5cm / 2.5" x 3.7"
Jetting Height:Approx. 0.5M / 19.6"
Cover Diameter: Approx. 0.4M / 15.7"
Jetting Height:Approx. 1M / 39.3"
Cover Diameter:Approx. 1.1M / 43.3"
Jetting Height: Approx. 1.2M / 47.2"
Cover Diameter:Approx. 1.3M / 51.1"
Jetting Height: Approx. 1.5M / 59"
Cover Diameter:Approx. 1.5M / 59"
Jetting Height: Approx. 1.8M / 70.8"
Cover Diameter: Approx. 1.6M / 63"
Jetting Height: Approx. 2M / 78.7"
Cover Diameter: Approx. 2M / 78.7"